I found a wonderful resource for teachers and administrators that "illustrates how teachers can use technology to enhance learning for K-12 students. 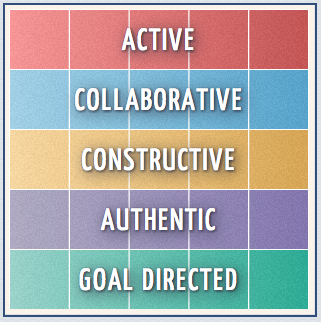 The TIM (Technology Integration Matrix) incorporates five interdependent characteristics of meaningful learning environments: active, constructive, goal directed (i.e.. reflective) authentic, and collaborative... The TIM associates five levels of technology integration (entry, adoption, adaptation, infusion, and transformation) with each of the five characteristics of meaningful learning environments. Together, the five levels of technology integration and the five characteristics of meaningful learning environments create a matrix as illustrated" HERE. You'll find stages that are in your own comfort zone, yet you'll also see how you can grow and move toward a deeper and richer level of integration. Videos are linked so that you can actually see projects that correspond to the items on the matrix. You'll find a Matrix by Grade Level HERE.